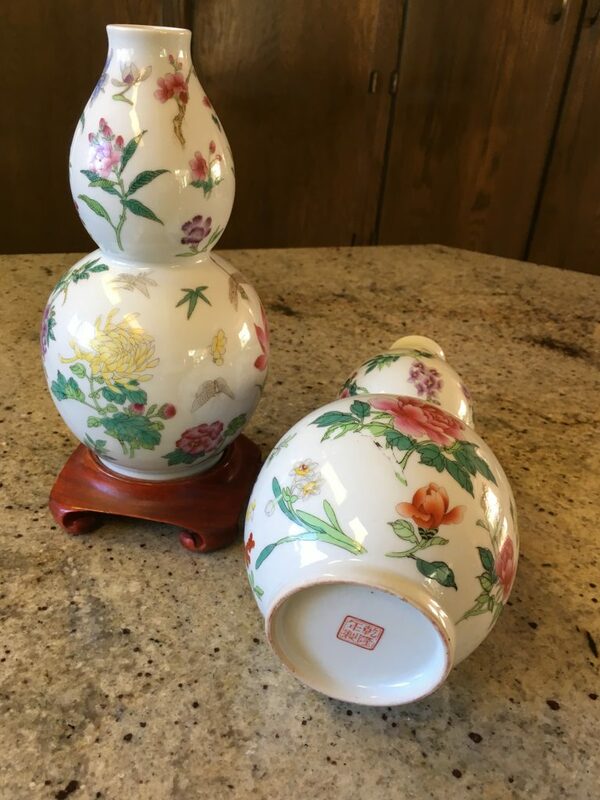 This pair of vases is charmingly decorated on a pellucid white porcelain ground with scattered floral sprigs emblematic of the four seasons, in the delicate enamel colors of the Emperor Qianlung period. The flowers consist of lotus, iris, magnolia, peony, hydrangea, pinks, hibiscus, wisteria, daisy, Chrysanthemum, prunus, and the monthly rose (yueh chi) which flowers in China the whole year around. Flying in the air between the floral sprigs is a couple of butterflies and a couple of dragonflies. The fluid shape of these vase, filling in on the white translucent ground with opaque enamel of different tones that colored the floral sprigs, gives these vases a feeling of simple elegance. The floor rim of these vases shows a pale coppery color paste. The bottom is inscribed with a seal in underglaze red, ‘Ch’ien lung nien chih’, meaning “made in the reign of Qianlung”. This pair of vases with gaily enameled floral blossoms and flitting butterflies and dragonflies, motifs conveying happiness and good fortune, was very likely made as a wedding or birthday present.